William Young, Bookseller and stationer, corner of Chestnut and 2nd Streets, No. 52, Philadelphia. Advertisement for William Young, Bookseller and Stationer, 1795, William Young Papers, Folder 1, Delaware Historical Society, Wilmington, Delaware. 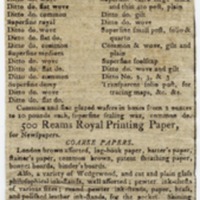 “Ad for William Young, Bookseller and Stationer,” DelaWARES.org, accessed April 23, 2019, http://delawares.org/items/show/116.